The whistles and cheers of the men of the division echoed through Hau Nghia Province last week as Danny Kaye, on tour of Vietnam, became the first entertainer to appear for the Tropic Lightning troops since their arrival at Cu Chi. Greeted by Major General Fred C. Weyand, division commander, the Kaye entourage staged two performances at the newly built division amphitheater. Kaye, who was accompanied by popular singer Vikki Carr, visited wounded soldiers at the 25th Medical Battalion's field hospital to take the show to men unable to attend. 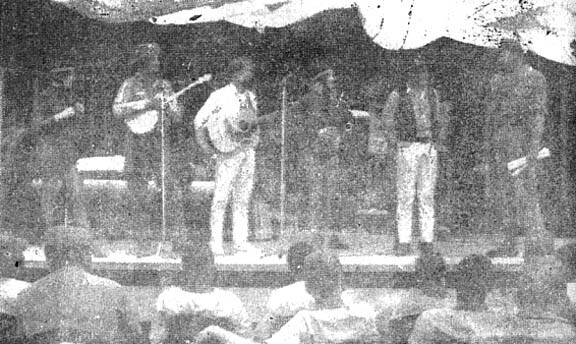 Lunching with the 1st Battalion, 27th Infantry "Wolfhounds", Kaye and the other performers were entertained with songs of the islands from the men who were based in Hawaii before being sent to Vietnam. It was, said one soldier, one way of saying thanks to the performers for going to Cu Chi. The entertainers were presented with honorary memberships to the division by General Weyand during their second performance. James Drury, TV's Virginian, currently on tour in South Vietnam, treated more than 2,000 troops of the 25th Infantry Division to more than an hour of comic western ballads and dancing "a la GO-GO" this week at the division's new amphitheater. Arranged by the Division Special Services Office, the U.S.O. show featured, in addition to Drury, the South Hollywood Buffalo Hunters and dancers Lori Bigley and Joni Lyman. Drury and his troupe were greeted by Major General Fred C. Weyand, division commander. After the afternoon performance, General Weyand presented the performers with honorary memberships in the "Tropic Lightning" Division. Senator John G. Tower (R-Tex.) 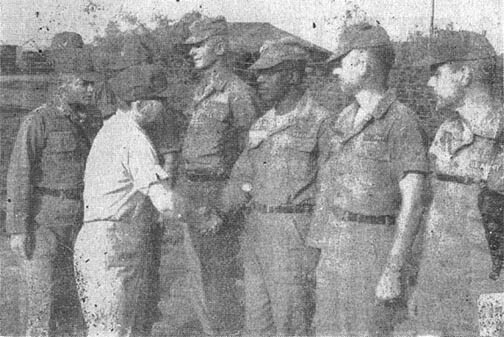 (in civilian clothes) shakes hands with Major Herbert Evans, commanding officer, 3rd Support Battalion (Provisional), during the senator's visit with 3rd Brigade. Behind the senator is Colonel Everette A. Stoutner, deputy brigade task force commander. Brigadier General Glenn D. Walker last week became commander of the 3rd Brigade Task Force in ceremonies at Pleiku. General Walker, who is also the assistant division commander/maneuver, assumes command of the task force from Colonel Everette A. Stoutner, who is now deputy task force commander. Following a 13-gun salute fired by a battery of 2nd Battalion, 9th Artillery, Col. Stoutner turned over the brigade colors to General Walker. After a brief speech to the assembled officers and men of the brigade, the general was guest of honor at a reception for the officers at the brigade mess. Lieutenant Colonel Harley F. Mooney, Jr., has assumed command of 1st Battalion, 27th Infantry, replacing Lieutenant Colonel James H. Cawthra, who has been reassigned to Headquarters, U.S. Army, Vietnam. His assignment as commander of the "Wolfhound" unit marks the second time Col. Mooney has served in Vietnam. He arrived in-country in January with 2nd Brigade, when he was commanding officer of 2nd Battalion, 27th Infantry. He was called back to assist in training "Tropic Lightning" soldiers coming to Vietnam and to recover from a chronic leg ailment. Before he joined 2/27th last year, Col. Mooney was the assistant division chief of staff. 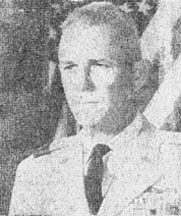 Executive officer for 1/27th in Korea, where he suffered a leg wound from Chinese shrapnel, Col. Mooney served under Major General Fred C. Weyand, division commander, who was then a unit commander. 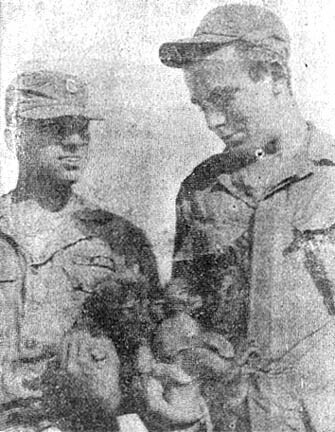 Col. Mooney holds the Silver Star, the Bronze Star, with one Oak Leaf Cluster, and three Purple Hearts for action in Korea. Col. Davis Greeted By 25th Avn. Bn. Lieutenant Colonel Edward P. Davis, formerly assigned to Strategy and Tactics Analysis Group, Bethesda, Md., arrived this week to assume command of 25th Aviation Battalion. Colonel Davis, a native of Lexington, Va., and a graduate of Virginia Military Institute, replaces Major George J. Young, who was acting as interim commander of the battalion. During his 17 years in the Army, Col. Davis has received the Army Occupation Medal, the National Defense Service Medal, the Army Commendation Medal, the Army Aviation Badge and the Parachutist dodge. The transition from the dry northeast monsoon to the moist southwest monsoon is expected to be completed by the end of May, according to the May climatic summary. May is a wet season month over most of Southeast Asia. Most rainfall is produced by afternoon and evening showers or thundershowers. The mean number of days with rain is 17 with an average of 10 inches. The normal daily maximum temperature during May is 95, with the minimum near 73. The maximum is usually reached between 2 and 4 p.m. Lieutenant General John A. Heintges, deputy commanding general for the U.S. Military Assistance Command, Vietnam, visited Cu Chi last week for a short tour and briefings on the 25th Infantry Division. He was welcomed to the division's base camp by Major General Fred C. Weyand, "Tropic Lightning" commander. His tour of the area included visits to Division Artillery, 3rd Battalion, 13th Artillery, and 69th Armor. Colonel Daniel B. Williams, Division Artillery commander, pulled the lanyard at 1st Battalion, 8th Artillery this week to send "Automatic Eighth's" 50,000th round of 105mm howitzer firepower tearing into Viet Cong positions. The occasion came just five weeks after "Tropic Lightning" artillery had greeted enemy positions with their 25,000th round and a little over two months since the first round had belched from the big suns of the division's 2nd Brigade. Corporal Terry M. Witherington, of Cochran, Ga., officiated when 8th Artillery zeroed its first round on enemy positions on January 19. He was on the job again to send off the battalion's 25,000th round on March 8. The "Automatic Eighth" has already set many records. On one day, a total of 2,100 rounds were fired by the battalion. One battery alone fired nearly 1,700 rounds in a single day. Some Army stateside divisions are below full combat-ready status, but this is according to plan, according to a Defense Department Spokesman. It was recognized that some divisions would have to be used for training once the decision was made not to call up the Reserves, the spokesman said. "So the present status is not surprising, but was planned that way." Divisions mentioned are the 1st and 2nd Armored, 4th Infantry and 5th Mechanized. Some of these, he said, are expected to reach full combat readiness status by June. The spokesman, referring to previously announced figures said another 21 combat-ready divisions could be deployed to Southeast Asia between now and the end of June, if required. This could be accomplished, he said, without calling up the Reserves or National Guard, making 64 combat-ready battalions in Southeast Asia. In an emergency, the equivalent of nine combat-ready division forces could be ready for deployment in 90 days, the spokesman said. This could be accomplished by a Reserve call-up and extending enlistment terms and RVN tours. The post exchange, the serviceman's corner store, has evolved from the homespun operation a la Beetle Bailey into a far-flung, bustling business spanning 12 million square miles in the Pacific. And it is the Pacific Exchange System (PACEX) which administers the staggering organization which supplies grass skirts in Hawaii, Hakata and Sakura dolls in Japan and Hong Kong-produced brocade in Vietnam. PACEX, with its nearly 4,000 activities served by 14,000 employees of a dozen different nationalities, has emblazoned its familiar imprint wherever American servicemen are: in Japan, Korea, Okinawa, Hawaii, the Philippines, Thailand, Guam, Vietnam and Hong Kong. A diverse organization, PACEX hardly limits itself to razor blades, magazines and candy bars. The Philippines Branch, for instance, operates the only bulk milk reconstitution plant it the system, while the cab company concessionaire in Hawaii has been part of PACEX since 1928. The welcome sight of a white PACEX snack truck in the many places where the service operates hardly rivals the Korean branch for rolling stock. In the Land of the Morning Calm, a snackette on the Seoul-Pusan train keeps traveling servicemen refreshed. But in a land still undergoing sweeping transition and development, PACEX has been put to the test to keep fighting men supplied in Vietnam. It is here that many servicemen get their daily necessities from impromptu PXs set up in CONEX containers, temporary buildings or native huts pending completion or renovation of new quarters. The PACEX motto - "Service to Fighting Men" - means what it says. One girl asked if it snowed much in Vietnam. A young boy expressed the minority opinion that Batman is "pretty dumb." And a young lady, 20 years old, wanted someone to write her because she was "lonely." in all cases, the letters were simply addressed to "any American soldier in Vietnam" from an American citizen, and, if nothing more, they all sparkled, with good cheer and sincerity for those far away. The avalanche of letters came from all sections of the United States - from eight-year-old boys to an 82-year-old great grandmother - and the men at Cu Chi gobbled them up.. The men of 2nd Bde. found Easter cards from the seventh grade class of Rittenhouse Junior High in Norristown, Pa. They found letters from those devoutly religious, from those shouting patriotic encouragement, from those who simply wanted to write a G.I. One even came from a Bronx, N.Y., girl who was against the administration's policy in Vietnam, but she still wanted to say that "even those of us who are anti-war haven't forgotten you." "I'm involved in so many extracurricular and social activities," she wrote, that I don't even have time for my school work. Tomorrow, I'm cutting school and going on a protest march to Albany . . . I'm just busy, busy, busy." Most of the letters begin, "I wish this letter could be a little more personal but it's hard to write to someone whose name you don't know. I don't know you and you don't know me. I find it strange to write someone I don't know..." But most of them end, "Please write." Among the younger set, school seems to predominate in their thinking. During the transit strike in New York, one girl, a sophomore at Mater Christi High School wrote that the parochial high schools have been closed today and "probably the rest of the week, I hope." Sherry Campbell, 13, of Richmond, Va., says she's in the seventh grade. "I hate my English and history teacher. She's so mean I don't know how she can live with herself. If you see her in the morning before school and say, 'Hi!' she just gives ya a dirty look. And it's not just me - nobody likes her! Oh well, so much for her. Douglas Crawford, 12, of Richmond, W. Va., was proud of American accomplishments in Vietnam. "I really envy you guys," he wrote, "because you guys at least get to fight for what you want, but us, we can't fight the school so we have to go." Johnathan Watson, 14 1/2, of Gore, Okla., said he'd be doing better in school if he could keep his mind off girls long enough. Roger Christensen, 11 1/2, Alden, Minn., was apparently having problems, too. "I am in the sixth grade at Alden School, hope to go to the seventh this fall." Sometimes the younger ones write about home life. One 13-year-old has three sisters and no brothers and he is quite unhappy about it. "About having three sisters and no brothers," he said, "It was a bad deal but my parents couldn't help it. I have two girls I like a lot. Last Friday I went to a dance at school but I got the flu there and had a pretty miserable time." Another wrote, "My sisters' ages are 15, 10 and two, so that makes it pretty hard to do my homework. I have just finished watching Batman on T.V. It is pretty dumb but my sisters like it. Well, it looks like I have to shove off..."
"Hi," another wrote, "I hope you feel good because I do. I suppose you've heard about Batman and Robin. Boy, is it wild!" One girl brought her G.I. up to date with the news, reporting in her late March letter that "In case you haven't heard, the Packers defeated the Cleveland Browns for the National Football League championship. The United States sent up another rocket yesterday. But it got into trouble. I think it was the Gemini 8. Many express thanks and encouragement to the G. I. "Words cannot really express the deep thanks I feel in my heart to you for what you are doing for me," a Miami woman wrote. One of the students from the 7th grade class in Norristown, Pa., expressed the same thought in his Easter card greeting, although it was in a different form. Gerald L. Bouknight drew a bowling alley with red pins representing Vietnam. The fireball on its way down the alley said, "United States, the Ball of Fire " In big red letters was written, "That's right. Knock them all down. We're behind you." And that's delivering the mail. Captain Philip U. Bondi, of South Bend, Ind., was awarded the Army Commendation Medal at Cu Chi this week. He received the medal for meritorious service to the adjutant general's section of U.S. Army, Hawaii, for the period of March 1964 to January 1966. Lieutenant Colonel Herbert L. Forsythe, division adjutant general presented the medal. Keep an eye on any primary elections scheduled for your home state during the coming spring and summer. Study the candidates and the issues. Then vote according to your convictions. Far too many persons ignore the primaries and vote only in the general elections. This is especially true of the military, since members of the armed forces vote largely by absentee ballot and thus face problems not encountered by the civilians back home. For one thing, the civilians at home find it much easier to keep informed about candidates, issues and election dates. Military men and women can keep abreast, however, if they make the effort. In some states where one party is dominant, the real decisions often are made in the primary elections. What is decided there is simply ratified later in the general elections. If you want to make your ballot count, be sure you vote in the primary. Even where the two major parties are evenly matched, primary elections are meaningful. Here you have the opportunity to choose the candidates who will represent your party in the general election. Consult your voting officer about primary elections scheduled for your home state this year. Then read one or more newspapers from your home state to keep abreast of candidates and issues. If this calls for a little extra effort, consider it part of your responsibility as a member of the armed forces and as an American citizen. It's a small price to pay for the privileges you enjoy. Monsoon! It is a word which commands respect - and fear - for the damage monsoon rains can cause. A little foreknowledge about tropical storms could save your life. When the season arrives, heavy rains and accompanying lightning can be expected for five to fifteen days every month. Here are some safety precautions which may be helpful should you be caught in a thunderstorm. Try to avoid flat, open fields, and bare hilltops. If you are caught in such a place, lie fiat on the ground to reduce the chance of being the "high target". If you are in a group, do not huddle together; spread out and lie flat. If caught outdoors in a crowd of any kind, disperse as quickly as possible. During the storm, stay away from isolated trees, poles and large metal objects, including mounted guns, field pieces, wire fences and vehicles that do not have rubber tires. If a rubber-tired vehicle is available, get inside. If you cannot get inside, don't crawl under the vehicle to get out of the rain; the insulating effect of the tires may cause your body to become the conductor of an electrical charge from the vehicle to the ground. If a thunderstorm catches you in the water, get out immediately. In regard to communications, stay away from wiring inside buildings and try to keep phone conversations to a minimum. If the tactical situation permits, disconnect lead-in wires to field switchboards and telephones. In some cases, persons struck by lightning receive a massive electrical charge and are killed outright. In other cases, the individual is only momentarily stunned and paralyzed, and stops breathing. In this case, immediate use of mouth to mouth resuscitation and treatment for shock may restore breathing and save the individual's life. Following this, prompt medical attention must be provided. The TROPIC LIGHTNING NEWS is an authorized, publication of the 25th Infantry Division. It is published weekly for all division units in the Republic of Vietnam by the Information Office, 25th Infantry Division, APO U.S. Forces 96225. Army News Features, Army Photo Features and Armed Forces Press Service material are used. Views and opinions expressed are not necessarily those of the Department of the Army. Printed in Saigon, Vietnam, by Dai Doan Ket Publishing Company. PFC Wyman Swinton (left), of Glenns Falls, N.Y., holds Panzer, a shepard named after a German tank, and Specialist 4 Dan Schraufnagel, of Glidden, Wis., looks down at Menehune, Hawaiian for leprechaun. Panzer was restless. And so were Boom Boom, Lurch, Booby, Axel Rod, Sloopy, Sandy and Mule. A couple of them were a little jumpy. For five days they had waited, tossed in their sleep, skipped meals and paced around nervously. Most of them, however, finally accepted the fact that shots were coming and might even help them keep well, but now they just wanted to get it over with and the doctor was late. Dr. Marian Ray, chief veterinarian for the 4th Medical Detachment in Saigon, was an hour late last week for his scheduled appearance at division headquarters and his patients waited with reservation for his arrival. His patients, ranging from dogs to monkeys acquired by "Tropic Lightning" soldiers to make life seem more like home, were a motley sight, gathered in small groups around the admissions and disposition tent of the 25th Medical Battalion, waiting for rabies shots. Lurch began running after another dog. And Sandy joined. So did Booby and Axel Rod. And Sloopy hung on. Tigi, a five-pound monkey, purchased for 500 piastres ($4.24) in a nearby village by Specialist Four Stuart Allison, of the 65th Engineer Battalion, ran into a little trouble when she decided to pick a fight with 40-pound Boom Boom, a husky dog also a member of the 65th Engineers. 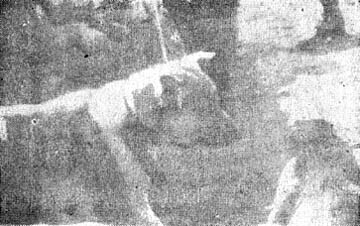 One dog, who certainly wasn't going to get lost, wore the GI dog tag of its owner, a status symbol among other canines who were issued nothing until the real dog tags arrived later. The animals, quite tired by now, went through the shot line with hardly. a whimper. As each left, the veterinarian assured each owner that their bark would be more dangerous than their bite. Boom Boom, a 40-pound dog, gives the evil eye to Tigi, a five-pound spider monkey, during a little horse play prior to inoculation ceremony at Cu Chi recently. The animals, belonging to 2nd Brigade, received rabies shots. All's well that ends well - between 30 and 50 feet down and eight feet in diameter. Just ask the men of Company B, 2nd Battalion, 35th Infantry at Pleiku. They'll tell you. They'll also tell you that they were far from all wet when they decided to become the division's only company-sized unit to have its own well. After the company became situated at the "Broncos" base camp, they soon found that it was no swimming party to come in from a long, hot day and discover dry shower heads sneering at them in the shower point. So Staff Sergeant Raymond D. Schablik, whose wife resides at Schofield Barracks, and Corporal Donald L. Maxwell, of Summer, Wash., got their collective divining rods together and decided digging was the only answer. Streaming over to see Lieutenant Colonel George A. Scott, "Cacti Blue" battalion commander, the two got quick approval for their proposed idea and the project was on. "We made a map study of the surrounding streams and came to the conclusion that we could hit the water table at between 30 and 50 feet," Sgt. Schablik said. Then the picks and shovels were pulled from boxes and a six-man crew began to dig a hole eight feet across with an end that may as well have been bottomless. Periodically, they came across shelves of hard dirt containing moisture. "Sometimes you could even squeeze the water out of some of it with your hands," Sgt. Schablik remarked. It was enough to keep the picks and shovels swinging with gusto. But, as with many undertakings in taming Vietnam, the project was still unfinished when water began gushing into the well. Next a pump was needed to get the water into storage drums. Even that problem was solved when the company pooled resources and purchased an electric pump, which arrived last week. "Now all we need is electricity to run the pump," Sgt, Schablik said. To the rescue will be the brigade's repair and utilities unit, which is scheduled to install a 100 kilowatt generator. A new well, producing nearly 30,000 gallons of water a day, has been dug at Cu Chi to replace a similar water supply which was contaminated when heavy rains collapsed the well sides. Standing 30 yards from the unusable well, the new 20-foot-deep excavation was reinforced with a 48-inch galvanized culvert well casing to prevent like collapses and contamination. The well will service two showers and quartermaster laundry with a water flow of 40 gallons a minute. Members of the 65th Engineer Battalion, who did the work on both wells, claim the new one will remain an adequate source of water indefinitely unless Cu Chi is struck by extreme drought. In a swampy area just west of Cu Chi, Chief Warrant Officer Claude Webber, of Columbus, Ga., squinted at the ground from the UH1D helicopter he was piloting. Below, a suspected Viet Cong cowered in a bush, trying to escape detection. Being a member of the bring-em-back-alive school, CWO Webber, along with his co-pilot, Chief Warrant Officer Clayton McLaughlin,of Kalispell, Mont., both of the 197th Aviation Company, waited. When the suspect rose from the bush, they raced toward him as the frightened VC attempted to escape. Circling around overhead, CWO Webber told his crew chief and gunner not to fire on the suspected enemy. 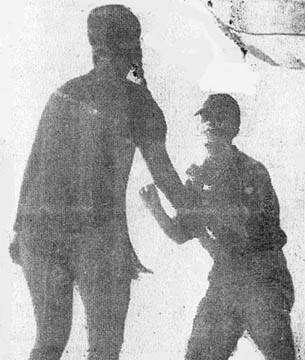 The Viet Cong, unaccustomed to Western roping techniques, hesitated as Webber set down the chopper right in front of the corralled suspect, Gunner PFC Louis Soward, of Covington, Ky., jumped out and nabbed his prey. Literally hog-tying the VC, Soward hauled his catch aboard. Claude Webber has spent 18 months in Vietnam, where be has logged more than 1,200 combat hours. When asked why he didn't fire at the suspect, he replied, "They're worth more alive than dead for the intelligence information you can get from them." Having similarly roped more than one VC, Mr. Webber shrugged it off as just another routine mission. the painless way to pay bills and save. They go by the code name "Dustoff." They are the flying ambulances whose speed and response have carried thousands of wounded Americans from jungle battlegrounds to field hospitals in Vietnam. Two of these "angels of mercy" supported the 3rd Brigade in the recently concluded operations Garfield and Lincoln. The Dustoff choppers were ready to go at any hour to assist any element of the brigade. Captain Ronald F. Hopkins, 2nd Platoon. 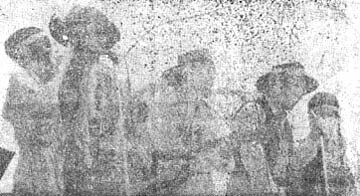 498th Medical Company (Air Ambulance), was the pilot of one of the two ships. He and his crew of four, usually based with the rest of the 2nd Platoon near Pieiku, were on call 24 hours a day in the brigade's field hospital. It was there that the requests for medical evacuation came on either the command radio network or the special dustoff network. The radio operator would jot down the necessary information, and as the last of the data were coming in, Capt. Hopkins was already warming up his chopper. More often than not, Dustoff will respond to a call even when conditions are at their worst. 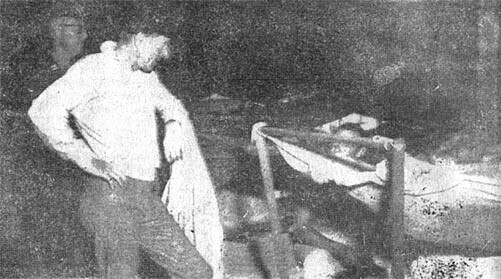 Frequently the calls for help come at the height of a firefight with the communists. Capt. Hopkins said, "Sometimes we feel that the VC are aiming directly at the big red cross on the side of our choppers, but they're probably shooting at any helicopter they see. At any rate, they do not respect the red cross at all." Once the casualties have been recovered, it is Dustoff's job to get them to a medical facility - fast. Seriously wounded are frequently evacuated directly to a complete medical facility, such as 8th Field Hospital in Nha Trang. Less serious casualties are taken to the 3rd Bde. hospital at the forward command post. As the Dustoff 'copter approaches the CP, Capt. Hopkins radios the hospital to report on the number and condition of the wounded. By the time the chopper touches down, ambulances and attendants are waiting to take the casualties to the hospital. It's often a long day for the Dustoff crews. They know the job they are doing is a vital one. It is with nothing but admiration that the "Tropic Lightning" soldiers look at the men who "dust off." Danny Kaye talks with some of the wounded soldiers at the division field hospital. Lori Bigley, of the Jim Drury Show, does the watusi with Sp4 Ronald Swift, 25th Administration Company. Members of the Jim Drury troop are awarded honorary memberships in the 25th Inf. Div. during their Cu Chi visit last week. The Jim Drury Show on stage at Lightning Theater at Cu Chi. From left: Jani Lyman, Jon Locke, Lee Burch, Jim Drury and Lori Bigley. Thousands of years of warfare and virtually hundreds of thousands of tactical and technical innovations have not yet changed the one, basic fact that the infantryman, the foot soldier, the man with the burning bunions, is still the ultimate weapon. The time is now, here, in Vietnam. My job was to become part of operation Makaha. At 6:00 a.m., I joined the third platoon of B Company, 1st Battalion, 27th Infantry, commanded by 2nd Lieutenant G. K. Wood. We were assigned to the third wave of a three-wave heliborne assault of operation "Makaha." The landing zone was an area of rice paddies and small hamlets 25 miles north of Saigon. The Viet Cong had staged a number of ambushes in this area over the past several days. It was now our turn to turn the tables. When we lauded, the first two waves had already been under light sniper fire for about half an hour but no real contact had been made. As the chopper touched down, the men leapt out of both sides and dived for cover behind dikes and bushes as if helicopter landings were second nature. As if the wave of an arm were a switch that set them in motion, they moved out in unison to the next dike. There was sniper fire on our right. Suddenly a bullet whizzed past and I dived for the nearest ditch. I landed on top of a private and he said, "Are you all right, Sir?" When I said I was not a sir, he told me that I was. Two more shots from the sniper were answered by the pop of M-16 rifles on both sides. Then all was quiet, so we stood up - very slowly. My ditch partner was covered with mud from his knees down; I was caked with it from my knees up. The platoon moved through a heavily wooded area and then across 400 yards of open fields. By now the heat of the Vietnamese sun was beginning to show in the streaks of sweat that crisscrossed the men's shirts. As we approached, there was more sniper fire. This time I landed on top of a sergeant but he wasn't anywhere near as nice as the private. The fire up ahead was getting heavy so we moved up to have a look. The plodding foot soldiers of a few minutes ago were moving nimbly from building to building. I watched a sergeant, as, with cat-like ease, he slid along the side of a house, kicked open the door and twisted into a position covering the entire room. Nothing. It was quiet on the street now. I followed Staff Sergeant Alfred Batungbacal, a 125th Signal Battalion photographer, out into the street. As we walked toward a machine gunner kneeling behind a stone marker, a shot cracked and a bullet ricocheted just in front of us. This time I was in the hole first. Sergeant Batungbacal, although laden with heavy equipment, followed amazingly quickly. "Hey, you mind if I rest this camera on your back while I take this shot?" he asked casually. This time it looked like we might have something. The platoon, now in positions on both sides of the street, cut loose with withering rifle and automatic weapons fire. Still the bullets were coming our way. Someone launched a rifle grenade froth the left and it was all over. Silence. All afternoon we pushed from hamlet to hamlet, searching for "the enemy" but found nothing but women and children and an occasional young man who, for some reason, had not run off to hide. While the men were being interrogated by the interpreter, someone spotted some blood on the ground, possibly from a wounded VC. He called for Lt. Wood and together they followed the trail. In the back room of a house nearby they found a woman and her two children. All three had been wounded by a Viet Cong mine that had been intended for us. Lt. Wood called for a medic to give first aid. A doctor would be following close behind with the mechanized units. For the rest of the afternoon we followed the same pattern of search and destroy, doing a lot of searching and finding little to destroy. At five o'clock we pulled up to another hamlet where we dug in for the night. Now it was the routine of finding a place to sleep, setting out a perimeter guard, establishing communications and the hundred and one other little things that must be done before settling for the night. I grabbed the first resupply helicopter back to Cu Chi, leaving the foot sloggers to spend the night on the ground. Tomorrow they would have more of the same. They would make a house to house search of the six mile walk back to Cu Chi. They would walk the same tired miles, drink the same hot water, eat the, same cold food and choke on the same dry dust as they had today.